Nowadays there are a lot of different disc golf basket options available. Up and coming manufacturers like Prodigy, Dynamic Discs, and MVP have more affordable course basket options that are making it easier than ever to get a disc golf course installed. With so many different basket options, which one do you choose? What is the best course quality disc golf basket? While some of the newer baskets are only known and have been tested by only a small population of the sampled survey, the most well known basket is clearly the Innova DISCatcher. From the basket options included in our survey, at the beginning of 2017 only 29.35% of respondents were familiar with the MVP Black Hole while 77% were familiar with the Innova DISCatcher. 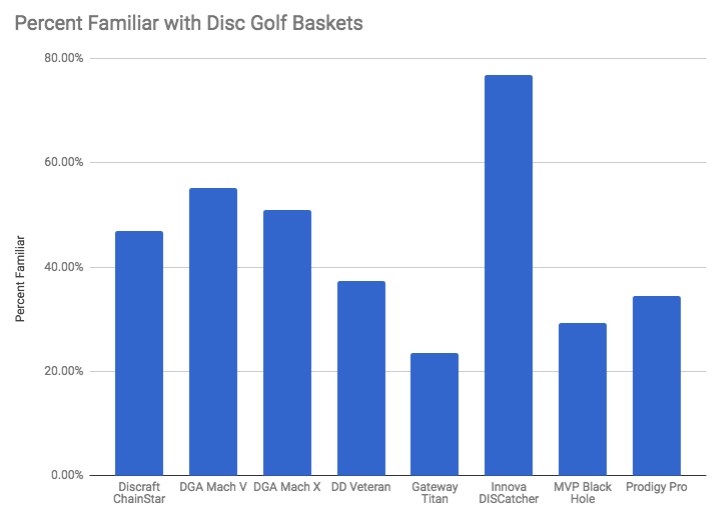 When we break down baskets by those rated “Above Average and The Best” the most favorable baskets are the Mach X, Innova DISCatcher, and Dynamic Discs Veteran. On disc golf podcasts and in the professional world there is talk about reducing basket size to align disc golf more with traditional “ball” golf. While a few pros are in favor of smaller baskets, the vast majority of those who participated in our State of Disc Golf Survey (88%) strongly feel that disc golf baskets are currently about just right. 9.7% wish that course baskets were bigger while just 2.3% want disc golf course baskets to be smaller.